The Cadalyst Systems Benchmark 2015 (C2015 v5.5b) can be used to test and compare the performance of systems running AutoCAD v2000–2019. Test files are available free for download. What's New in C2015 v5.5b (as of AutoCAD 2016): We made the following adjustments to the Cadalyst Systems Benchmark (C2015 v5.5b) for AutoCAD 2016. See the README_C2015.TXT file for further information about compatibility with older versions of AutoCAD. Verified operation with AutoCAD 2016 and made adjustments for the new system variable: startmode. Added an informational text screen for the benchmark's System Check test option. Updated the instructions and screen shots for configuring AutoCAD for the benchmark. Important note: The actual test procedures were not modified from the previous benchmark version, C2012; test scores from C2015 can be compared against scores from C2012 — using the same version of AutoCAD. ​What's New for AutoCAD 2017-2019: The Cadalyst Systems Benchmark 2015 (C2015 v5.5b) has also been verified to work with AutoCAD 2017 through 2019; check the updated README file (included in the zipped download available below) for instructions about an additional step required for these versions. 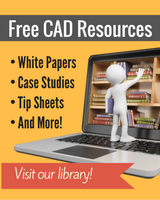 Note from the editors (July 2018): Cadalyst is requesting user input regarding future development, replacement, or possible retirement of the current AutoCAD-based benchmark test, which the publication has offered free of charge to the CAD community since 1996. Cadalyst editors welcome all related comments and requests at editors@cadalyst.com. The Cadalyst Systems Benchmark is designed for use with full, basic AutoCAD only. It is not intended for use and may not function properly with market-specific AutoCAD versions such as Architecture, Mechanical, or Civil 3D; AutoCAD LT; trial versions; international versions; etc. The Total Index Score is calculated based on subindex scores for four areas of performance: 3D Graphics, 2D Graphics, Disk, and CPU. The 3D visualization portions of the benchmark are compatible with AutoCAD 2009 and later; the 2D portions of the test work with AutoCAD 2000 and later. The benchmark compares the test times of your current system with a set of base times and computes an index number. An index score of 135, for example, means your test system is 135 times faster than the base system for the functions tested. Please review the README file in the accompanying download for full details and instructions for running the benchmark test and evaluating Total Index Scores. Remember, as is true for all benchmark tests, the Cadalyst Benchmark Test is merely a guide for measuring system performance. For further information about the Cadalyst Systems Benchmark, see related posts on Cadalyst's CADspeed blog. The original Cadalyst Systems Benchmark was released in 1996. All versions have been developed by Art Liddle, a former editor of Cadalyst magazine and now a physics teacher at Springfield High School in Springfield, Oregon. Copy all the test files to a test directory, such as C2015_test. If necessary, uncompress the files. You’ll need approximately 20 MB of disk space for all test files. The included README file provides a full description of the benchmark test and related files as well as instructions for use. Be sure to review this document carefully and view all included screen shots for full details on running the tests. ©Copyright 2018 Art Liddle and Cadalyst. You may freely use the Cadalyst Systems Benchmark and/or modify it for personal use only. This benchmark test (including all files) may not be copied, modified, or distributed for commercial purposes without the written consent of the copyright holders. Test results may not be published for commercial purposes without the written consent of the copyright holders. Questions and comments. After fully reviewing the details included above and in the README file included with the accompanying file download, please contact us with any questions or comments.